On the left hand page there are 3 kimonos ... the top 2 are embossed vellums which I have coloured from behind with oil pastels, the bottom blue one is the 3D paper folded kimono made with Japanese paper, The right hand page I stamped Clarity's geisha girl then masked her while I used a Sweet Poppy stencil and their paste to create the willow tree, when it was dry I rubbed it over with some Creative Expressions Patina Gilding wax. I then stamped the geisha again onto another piece of Japanese paper and just cut out and paper pieced her Kimono. 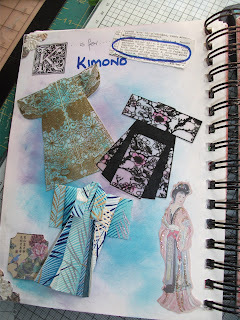 Here you can see a closeup of the 3 kimonos including the bottom one which is 3D paper folded Japanese paper. 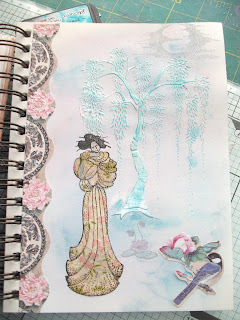 The second closeup shows the paper pieced Kimono on the Clarity geisha and the stencilled willow tree. Wow! 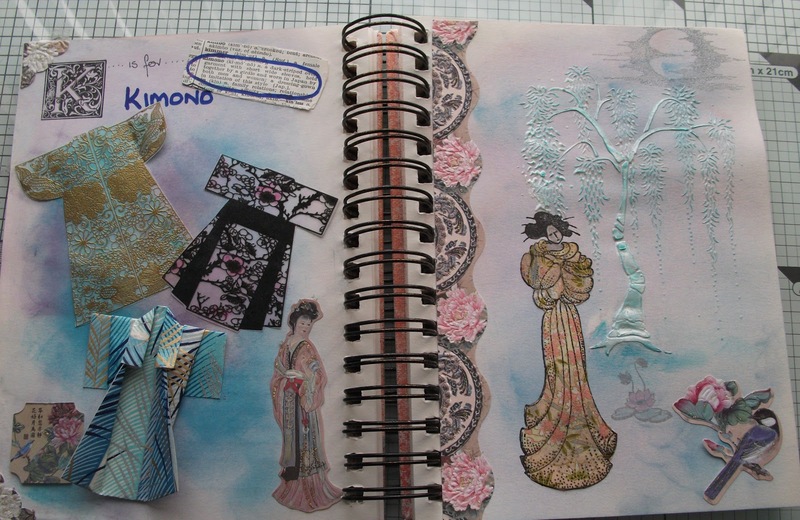 These pages are elegant and portray your K word beautifully. I love how you have stamped, paper folded and paper-pieced. Gorgeous papers and that tree...a-ma-zing! Wow that is one amazing page (well two actually. When I enlarged your first photo and saw all the detail is was incredible.Well done. Wonderful dictionary pages -- I love both pages - Bravo!! What pages of beauty you've crafted! How fun for you to have found the treasures to use with your word illustration. Well done! Beautiful pages, love the origami kimono and the stencil willow tree background.